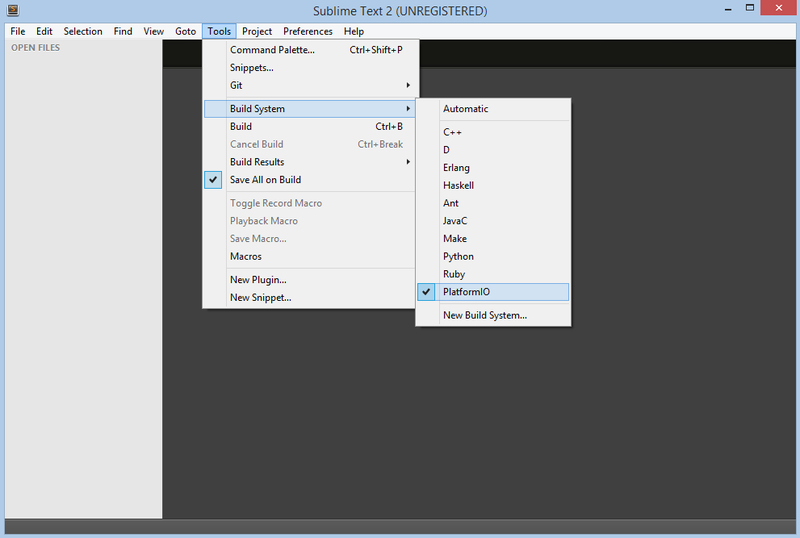 The Sublime Text is a cross-platform text and source code editor, with a Python application programming interface (API). 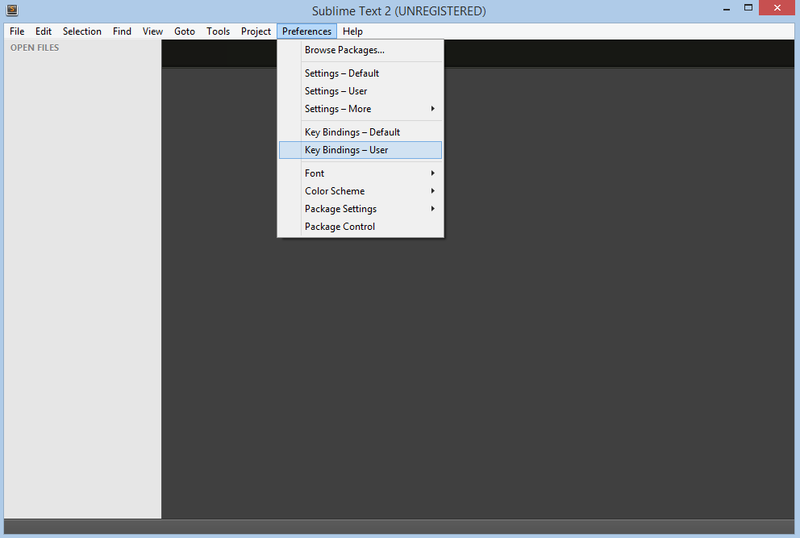 Sublime Text is proprietary software. Its functionality is extendable with plugins. Most of the extending packages have free-software licenses and are community-built and maintained. 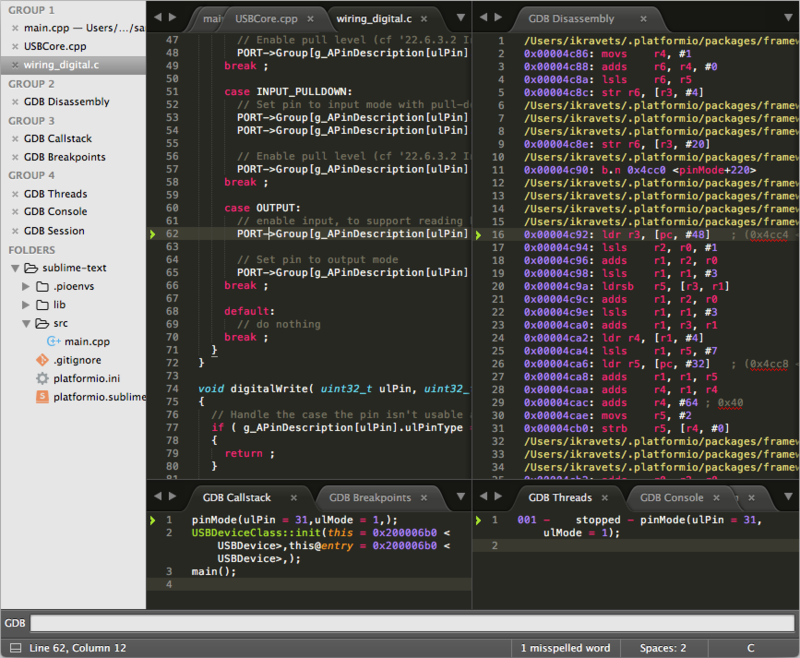 Sublime Text lacks graphical setting dialogues and is entirely configured by editing text files. 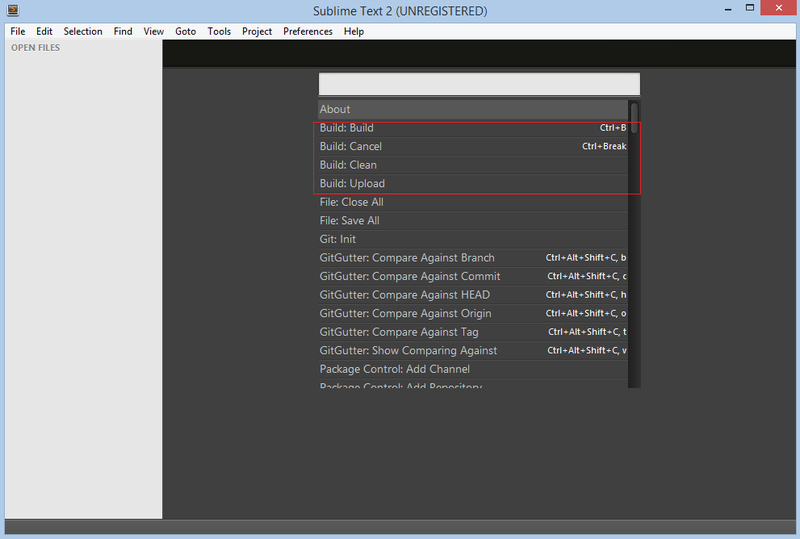 Refer to the Sublime Text Documentation page for more detailed information. We are glad to inform you about an awesome Sublime Text plugin for IoT development named Deviot. It is based on PlatformIO Core (CLI) and will automatically install it for you. Please visit official Deviot page for the further installation steps and documentation. Build project: Menu: Tools > Build. PlatformIO - Clean - Clean compiled objects. PlatformIO - Update platforms and libraries - Update installed platforms and libraries via platformio update. Please verify that folder where is located platformio program is added to PATH (wiki) environment variable. After that, we can use the necessary commands from Menu: Tools > Command Palette or with Ctrl+Shift+P (Windows/Linux) Cmd+Shift+P (Mac) shortcut. 2. Project Configuration File named platformio.ini must be located in the project root directory. Copy the source code which is described below to it. Taking everything into account, we can open project directory in Sublime Text using Menu: File > Open Folder and build it with shortcut Ctrl+B (Windows/Linux) or Cmd+B (Mac), clean project with shortcut F11 and upload firmware to target with shortcut F12. A debugging feature is provided by PIO Unified Debugger and new debug configuration named “PlatformIO Debugger” is created. No need to do extra configuration steps! Wait for a while, PlatformIO will prepare project for debugging and session will be started soon.